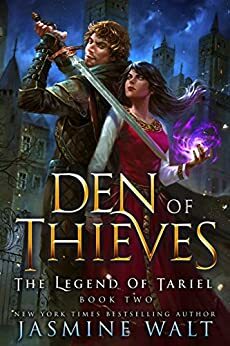 Den of Thieves, Book 2 in the Legend of Tariel by Jasmine Walt. Riann has been taken by bandits and the group doesn’t know where he is. The three remaining begin to track Riann through Tariel’s connection to him from their shared bond. Riann is being taken back to the bandits and has his first meet of Wellion the son of the leader of the bandits. Riann is given two options, to either become one of them or die. But with this decision, Wellion’s sister has decided that she wants Riann for herself even after Riann rebukes her on multiple occasions. Tariel, Yarim and Calrain begin the journey of finding the bandits and rescuing Riann. Along the way Tariel learns more about her abilities and her magic. Still fearful of the witch hunter Sir Jerrold the group has to stay on alert from more issues. The group works hard to all come back together. I love this series. It is one of my favorite Jasmine Walt’s series. I love the strength of Tariel and how she is always willing to adapt to everything around her. The guys are great and even with the introduction of Wellion to the dynamics does not distract from the ultimate goal of the story, in fact his dialogue and relationship with Riann really add to the story. I enjoy that each chapter is written from a different character’s point of view so that way how each person feels isn’t left out. I enjoyed the group dynamics even with the change of having Riann not with Tariel’s group for part of the story. It was a great insight into how they all work together. I can’t wait for the next book in the series. Grab Book 1: Kingdom of Storms here and read my review here.